Luxurious 2BR condo located in the heart of the prestigious Las Catalinas beachfront development just steps away from the beach, restaurants, Beach Club, Pura Vida Ride water toys and bicycles. 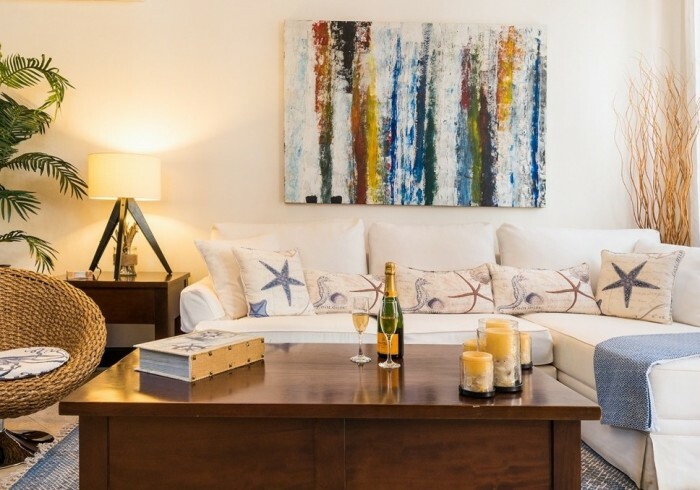 The condo is professionally designed by Xyanna Bateau to be bright and airy with original artwork by Carlos Hiller. One Master Suite has a king size bed w/private bath. The other suite has two twin-beds w/private bath. The two twins can be combined to form a king bed upon request. An additional fold-out bed and crib are also available for a small charge. Las Catalinas maintains extensive trails for mountain biking and walking. If you prefer water activities there’s paddle boarding, kayaking, snorkeling, body-surfing and beach bumming to keep you on the go. If swimming is more your style, there’s a beautiful salt water semi-olympic size lap pool at the beach club that will keep you coming back for more. Best of all, your visits to the Beach Club are included in your stay. Service comes first at Las Catalinas and you will be treated like Kings & Queens. To make your stay even more enjoyable, this condo comes with Las Catalinas’ signature House Mom service so you can enjoy a fresh breakfast prepared daily in your fully furnished kitchen.